Advanced Gravity Forms Google Spreadsheet Addon makes user to save gravity form data into the Google Spreadsheets. User can add any number of forms with any number of spreadsheet with sheet integration. gravity forms fields mapping so only selective data are added to sheet. Click to Sync – Synchronize all existing form entries to append google sheets rows. 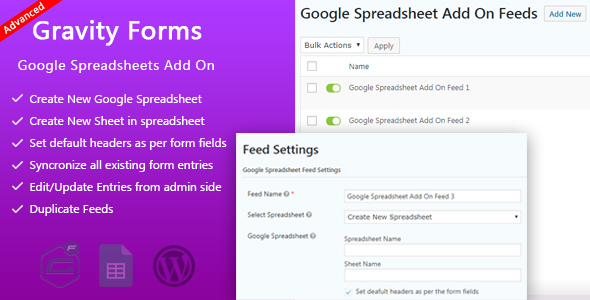 Edit/Update Sheets admin Option – It will be update existing sheet entries to google spreadsheet. Conditional Tag – All the condition met then entries will be append to the sheet. Option to send data only if payment is paid/approved.